$1,689.99 each List: $3,520.00, You Save: $1,830.01! The Pearl 28" x 14" Philharmonic African Mahogany Concert Bass Drum's 6-ply shell is naturally prone to amplifying deep, low frequencies - ideal for an instrument that is meant to make the seats in the terraces rumble! Mahogany also creates a darker, warmer tone than birch or maple. A drum of this size is easier to manipulate, while still having plenty of power to use in a large ensemble. It's also quite punchy when it needs to be, making it a fantastic candidate for marches and other pieces that demand clear, active bass drum playing. Fully-rounded bearing edges help focus the sound of the head and eliminated higher, unwanted overtones. You won't have to worry about annoying rattles either, with each oversized T-handle tension rod and claw insulated at every possible contact point. The tension rods are designed to be adjusted at a moment's notice, with coarse threads to make on-the-spot adjustments possible - which is important when you have to deal with different temperatures and humidity levels. Maple hoops are strong enough to keep the tension of the head perfectly even, and they're able to handle small bumps and bruises far better than mahogany. 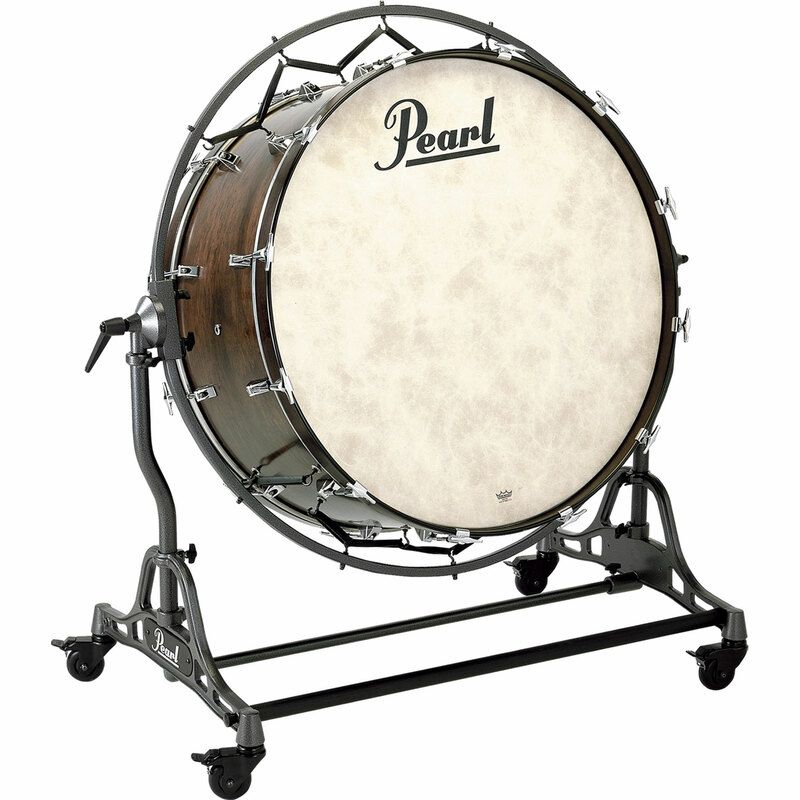 To allow the drum to breathe a little (increasing projection and overall tone) Pearl has equipped the shell with two acoustically-placed air vents. Pearl has included a Suspended Concert Bass Drum Stand with this drum, allowing you to effortlessly tilt the drum to whatever angle you'd like, from flat to vertical or anywhere in between. Solid rubber bungees suspend the drum within the stand, giving it as much resonance as it could possible have. Locking casters make transportation a cinch. This drum also comes with Remo NuSkyn heads, made to sound and feel like calfskin without all of the humidity problems you'd have with a real skin head. This is a big item and it’s going to ship by freight - that means it has to come to you by 18-wheeler. We ship from centrally-located Dallas, Texas. Howdy y’all!